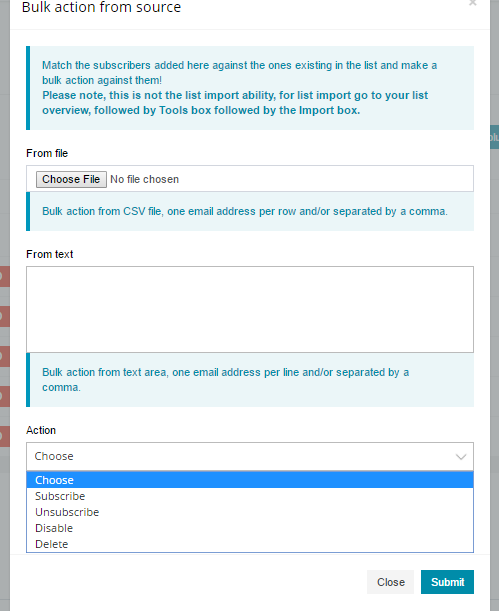 Due to some specific reason, you might want to delete email subscribers from the uploaded / existing email list. This guide will help you deleting list of selected email from the email list. 3. Inside new popup, you can upload or paste the email list and select “Delete” or “Disable” action according to the email of yours. Finally, click on “Submit” button to complete the action. This action will delete the given email subscribers from the email list.